A huge surprise. For the most part, my introduction to Johnny Winter follows the order of his major releases starting with The Progressive Blues Experiment. Due to the relative obscurity of First Winter, it took awhile for me to finally grab a copy. If you have not heard this album, but have heard plenty of early Winter, this album will be a bit of a shock. You will be able to pick out both Winter's voice and guitar playing throughout the album, but do not expect near as much blues and blues rock as his subsequent albums. 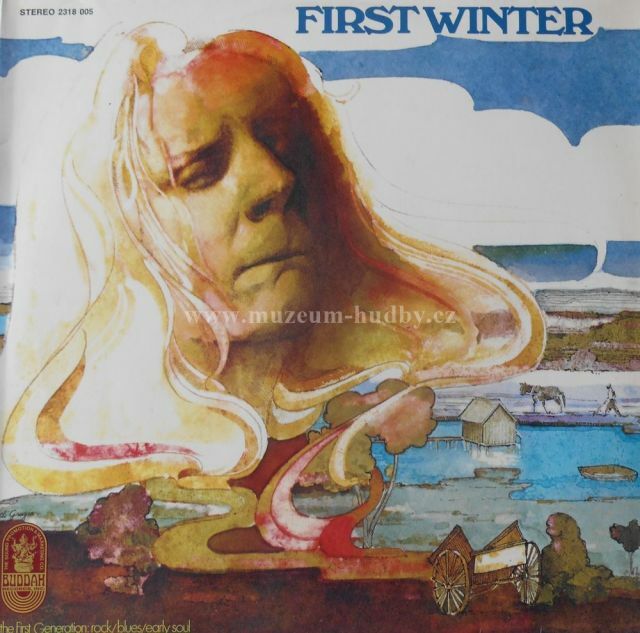 First Winter is a bizarre collection of blues songs, psychedelic rock songs, pre-soul songs (yes, soul is present here), and slower, sixties style rock and roll (the cover certainly hints at the psychedelic nature of the album). The odd thing is that the songs fall into these categories with little to no overlap between genres. As a result, the transitions between tracks is rough and the album as a whole is somewhat disconnected. Poor transitions aside, Winter completely rocks. Sure, the tracks are all extremely short and the entire album is under thirty minutes, but the content is loaded with catchy rhythms and melodies I like to think of as musical tapas. There are a few bluesy tracks here to entertain the Winter faithful, but also expect to enjoy at least a few of his other psychedelic or sixties rock tracks. 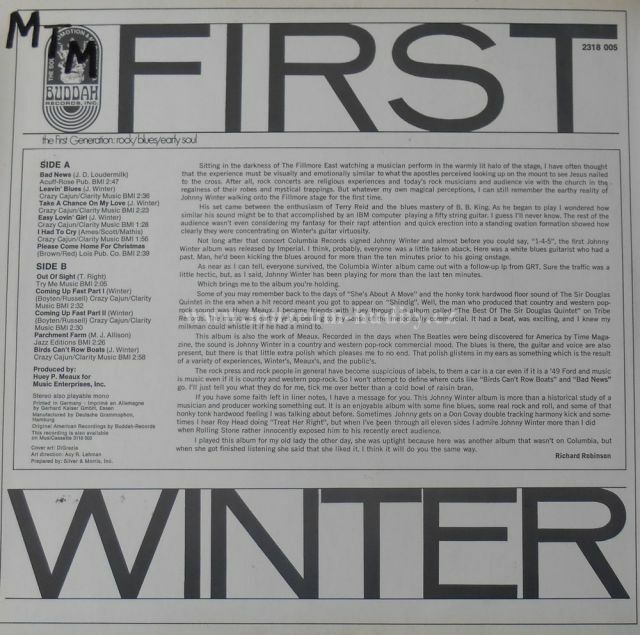 Unlike Winter's other early albums, he takes on the majority of the songwriting here. The A side is incredibly solid and highlighted by Winter's two psychedelic creations "Birds Can't Row Boats" and "Take a Chance on My Love." The first of these two features acid inspired lyrics and Bob Dylan sounding delivery. The second is the albums only instrumental track. "Leavin' Blues" is the bluesiest track on First Winter and most similar to his later creations. The B side, although not as solid, has a few gems as well. The early soul classic "Out of Sight" is wonderful as Winter's two other covers on this side, "Parchment Farm" and "Please Come Home For Christmas." The last of these is probably my favorite track on this album and one of the only Christmas themed songs I can still listen to and not throw up. The albums only flop is Winter's one-two combination "Coming Up Fast Part I-II." I cannot stand the vocal delivery or the lyrics during this (thankfully) short set of songs. Some of the tracks do seem one or two verses too short, which is my only other complaint - "Easy Lovin' Girl" at 1:28??? 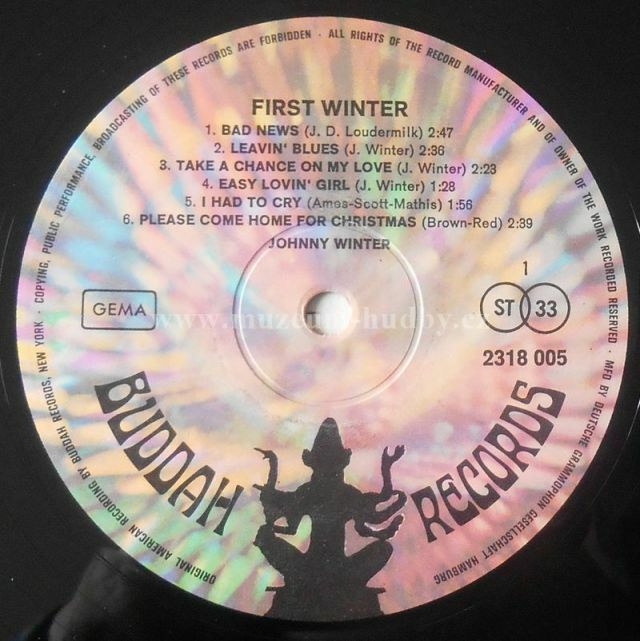 I was surprised that there were not a great deal of blues rock tracks on First Winter, but I was also surprised at the effectiveness of the non blues tracks. Winter certainly does not unleash the fury of his guitar playing as he does starting on The Progressive Blues Experiment, but his vocals are mostly spot on and filled with both talent and emotion. This album is a nice departure for Johnny Winter fans and does offer plenty for casual listeners of multiple genres (blues, rock, early soul, psychedelic rock). Many of the tracks found here can also be found on later compilation releases such as the 1988 release Birds Can't Row Boats. Indeed, Buddah Records for the win. Those who can't stand Johnny Winter would like several of the tracks here. Apparently, he re-recorded the vocals, changing the lyrics, then pasting it on top of the original "Birds Can't Row Boats" track for this 1969 album. I like the original vocal version better, probably recorded '66-67, and is not on here. The original lyrics is about a man wondering what an old statue would say if it could see the present: "I don't think he'd understand the mood of people living today/ I don't really know if he'd ever want to live in such a way." "Coming Up Fast" sounds like a mid 60s punker using girls skirts as a metaphor for change. Its probably one of the best tracks on here. "Easy Lovin' Girl" could be mistaken for Roy Head. One could easily skip this album and just get the "Johnny Winter Story 1959-1967." A conglomeration of early work by this blues guitar hero. Not a standout for sure but this is Johnny Winter after all so there is something to like, that great guitar. Much better stuff is coming, this is a take-it or leave-it. Compare this to his release " Birds Can't Row Boats ".